Thousands of pack animals and cavalry horses in WWII labored in the German Army, and many were killed in combat or slaughtered by starving soldiers. By 1939 the German Reich possessed 3,800,000 horses while 885,000 were initially called to the Wehrmacht as saddle, draft, and pack animals. Of these, 435,000 horses were captured from the USSR, France, and Poland. Additional horses were purchased from Hungary, Romania, Czechoslovakia, and Ireland. Klaus Christian Richter, himself a member of the 1935 German cavalry class, commented in his book Cavalry of the Wehrmacht 1941-1945 on the physical and psychological stress of the war: “The old soldierly virtues proved themselves once more: courage, sense of duty, feeling of responsibility, comradeship, and as well love of the horse.” German riding schools, horses, and riders were of the highest quality, and from 1930 to 1940 competed in every important international event. Their crowning achievement came at the 1936 Olympics when the German team won six equestrian gold medals and one silver, dominating all three disciplines—dressage, jumping, and military—a feat never repeated. 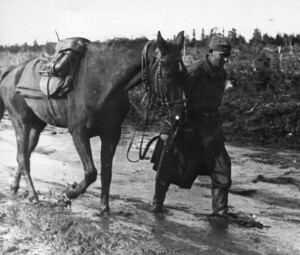 Slogging through mud on the Eastern Front, a German soldier leads his horse forward. Prior to 1935, thanks to a staggering 12 years of military service required for enlisted men and NCOs, a great amount of time, up to 3,000 hours, was spent on basic rider training in the German cavalry. This laid an excellent groundwork for the horse-mounted troops, although as Germany moved toward war the rider training was reduced to an average of one hour per day, with the riders now focusing on weapons and combat strategies. While much of their duties were aimed at reconnaissance and scouting, the horse troopers trained as much as the infantry. Training was rigorous, often days of 30-60 miles in the saddle, each horse carrying upward of 250 pounds of man and equipment. Many German soldiers were accustomed in civilian life to tilling the rich farmlands of Germany, in which animals, particularly horses, were an integral part of their lives. They had a special bond with the animals, a bond of blood and soil. 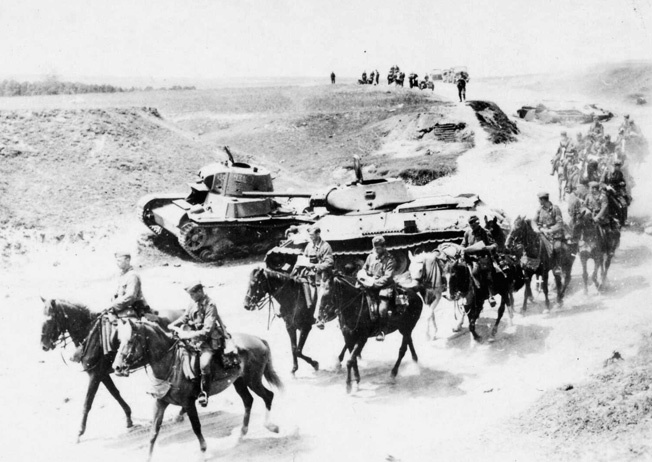 While the popular conception of the German military machine was just that, a massive array of tanks, armored vehicles, troop transports, and trucks, much of the heavy hauling was actually done by horses. In addition, thousands of troops went to war on horseback in the German cavalry. Their mounts were chosen by special committees that purchased horses at the age of three with training beginning at four and continuing for two more years in a program unsurpassed by any other nation. Heavy draft-sized horses also entered service as the wagonloads grew heavier, while a number of Berber horses entered Wehrmacht service after the fall of France. 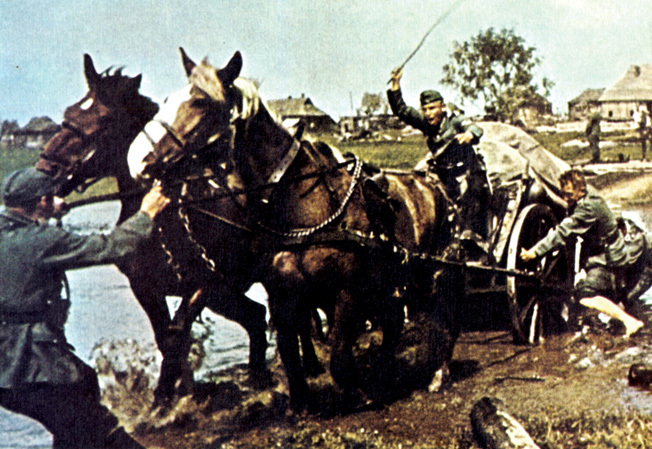 Unloaded wagons themselves could weigh from 610 to 1040 kilograms and could require four to six horses to pull them, especially across the difficult terrain and unimproved roads of the Eastern Front. Waffen SS cavalrymen, members of one of two regiments that were formed into a brigade in the summer of 1941, appear cheerful and relaxed astride their mounts. Horsemanship was also taught at the SS academies, as it was considered part of the legacy of the Teutonic Knights to which the Nazis ascribed. Unlike American cowboy movies in which, miraculously, no horse is ever injured during blazing gun battles, horses littered the roads and fields of Europe, killed by machine guns, mortars, artillery fire, and air attack. During the killing Russian winters, pampered German farm and riding horses, lashed to heavy wagons, dropped in their tracks. Often they became food for the starving soldiers. The German cavalry corps, which in wartime consisted of horse, bicycle, and motorcycle troops, contained 18 horse regiments. Disbanded at the outbreak of the war in 1939, they were reformed into divisional reconnaissance battalions, followed in 1943 by what is considered the rebirth of the German cavalry. Three regiments were reconstituted. The size and equipment of the German military were restricted by the Treaty of Versailles, which ended World War I. Motor vehicles for the military, for example, came under strict control. The treaty did allow for seven infantry divisions and three cavalry divisions consisting of 18 regiments. In effect, the cavalry made up a large part of the German Army, with 16,400 of the full complement of 100,000 soldiers allowed in the German Army by the treaty riding on horseback. Germany’s World War I foes considered the horses antiquated by the standards of modern warfare, and they believed the expenses associated with maintaining them would siphon funds away from other military activities. At first, the German cavalrymen even carried lances, which eventually gave way to carbines. In late 1934, motorcycles entered the picture, with the 11th, 12th, and 16th Horse Regiments now serving as motorized rifle troops. In effect, these cavalrymen were now riding “iron horses,” principally German-made BMWs and Zundapps. Other cavalry regiments were re-equipped as tank regiments, including panzer, antitank, and reconnaissance units, while the Waffen SS also had cavalry units. Horses were also employed by other elements of the Army, including the infantry, artillery, pioneers (engineers), medical units, and supply units. As of 1935, a cavalry platoon was assigned to each active infantry regiment and comprised 32 men and 33 horses. In addition to 13 other regional riding schools, a special cavalry school operated in Hanover for replacement officers and for both vehicle driving and riding instructors. In many cases, particularly later in the war, women assumed the instruction duties. As an adjunct, horse racing was encouraged in the Wehrmacht, and the “jockeys” wore a variety of 38 different racing colors representing the various battalions and regiments. In addition, some horse-mounted and horse-drawn units augmented their training by keeping and hunting foxes. 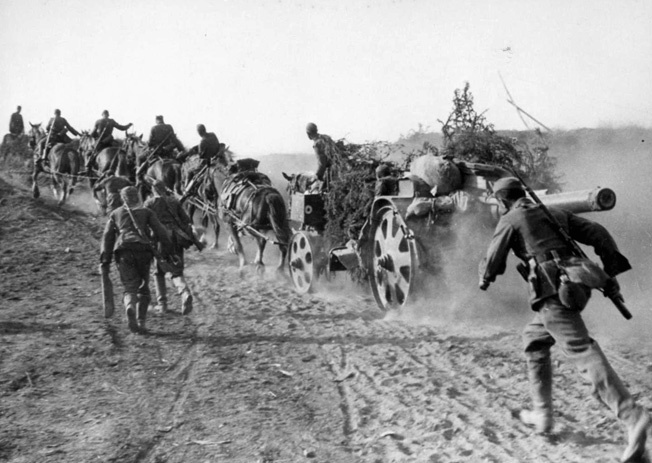 A team of horses strains under the weight of a heavy artillery piece, which produces a cloud of choking dust as German soldiers advance alongside. Note the makeshift attempt to camouflage the gun. Horse-mounted soldiers wore gray uniforms with leather trim, as well as riding boots of soft leather, taller and without the hobnails of the foot soldiers’ marching boots. After completion of rider training, the riding boots were fitted with buckled spurs, a telltale identifier on photos from the era. The trooper’s backpack held a tent square or shelter half, basically a section of material used as camouflage, raincoat, or shelter. In many cases, this was the only protection against the Russian winter, for which the Army had not prepared. This mistake proved fatal for thousands of landsers, as the German soldiers were called. As for weapons, every horse-mounted soldier carried a saber in a leather pouch when riding. After 1939, every officer carried the MP-38 and later the MP-40 submachine gun. All others carried the standard infantry issue Karabiner 98K carbine, a modified version of the long standard 98a, its shorter length making it more suitable for mounted troops. The carbine was based on an 1898 design, and while five rounds could be pressed into the magazine, it required a manual opening and closing of the bolt action to eject a spent round and cycle a new round into the chamber. In contrast, the standard U.S. issue Garand, a gas-operated semiautomatic design, required no bolt action and thus increased its firepower. Many veterans on both sides said this was often the difference between life and death on the battlefield. Officers, sergeants, and medical personnel also carried the Pistole 08, a 9mm semiautomatic, better known as the famous Luger. Some horse troops were issued the new 7.92 MPi 43/44 assault rifles, predecessors of the modern infantry weapons of today. Each squad of horse soldiers consisted of nine troopers, and an MG 34 light machine gun provided additional firepower. Horses were also integral to the mobile field kitchens and the blacksmith, ammunition, and weapons wagons. While each troop had a motorcycle dispatch rider for maintaining long-distance communication with command, most communication on horseback consisted of 25 standard hand signals. During the spectacularly successful Wehrmacht offensive of 1941, German mounted infantrymen advance past Soviet tanks that were knocked out in earlier combat. Later, the horses would suffer greatly during the terrible Russian winter. A cavalry brigade consisted of 6,684 men and 4,552 horses plus 409 horse-drawn vehicles and 318 motorcycles (153 with sidecars), as well as 427 cars and trucks and six armored scout cars. After the success of these troops during the 1939 Polish campaign, the 1st Cavalry Division was formed in October 25, 1939. The cavalry division would go on to fight in Holland, Belgium, and France during 1940. When it was time to attack Russia, the division came under the command of Panzer Group II, commanded by General Heinz Guderian. At this stage, because some 17,000 horses were employed, the sheer number caused supply problems. As a result, during the winter of 1941-1942 in Russia the Army’s cavalry operations ceased. The specially trained horses were relocated to noncavalry units, where they were basically squandered. After the ravages of the 1941-1942 Russian campaign, the 1st Cavalry Division became the 24th Panzer Division, functioning as 85 divisional reconnaissance battalions. These were the last of the German cavalry. Because they were often sent into the fiercest battle situations, they earned the honorary, but somewhat ironic, title of “division fire-brigade” as if they put out the raging conflagrations of battle. However, the horse-mounted cavalry itself was soon consumed, leaving the bicycle troops to carry on their reconnaissance and scouting duties. As the war progressed, each cavalry platoon decreased in size from three squadrons to two, but they continued to perform in an exemplary manner. At higher levels, the cavalry force was reorganized as three regiments and as two cavalry brigades in 1944 during the German retreat and final battles of the war. Mired in mud up to the axles, a German supply wagon is caught in the quagmire of a Russian road. Soldiers attempting to push, pull, and exhort the pair of horses drawing the wagon to extricate it from the trap caused by the spring snow thaw and heavy rain. In March 1945, the horse troops took part in defensive operations along the Danube River. They surrendered in good order to the British in Austria, with a final horse march through Wurttemberg in June 1945. Held as prisoners of war for only a brief period, they were released, and their horses were returned to the fields under the care of local farmers. The two Waffen SS Cavalry Divisions, after fighting for two years on the Eastern Front, were destroyed in the desperate fighting around Budapest, which was taken by Soviet forces on February 11, 1945. Wehrmacht cavalry units composed of anticommunist Cossack volunteers surrendered to the British, and despite promises to the contrary, they were forcibly repatriated to the Soviets who considered them collaborationists and traitors. As a result, the common soldiers received eight-year prison sentences in the Gulag system, while the higher ranking officers were hanged. 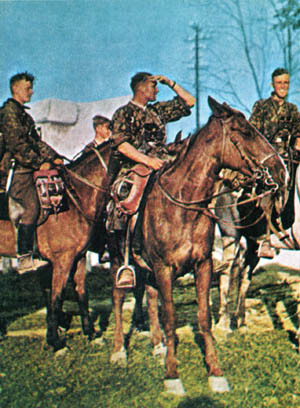 The number of horses and mules used by the German military eventually amounted to 2,750,000. Of these, an estimated 750,000 died during the war. Paul Garson has done extensive research on wartime postcards and photography. He resides in Los Angeles. Tags Axis, Blitzkrieg, Cavalry Brigade, Eastern Front, general heinz guderian, German Cavalry, Horsemanship, Nazi Germany, Operation Barbarossa, Red Army, Soviet Union, Treaty of Versailles, Waffen-SS, wehrmacht. Can I post your article in my blog.